When HR Services Scotland talk about helping companies to obtain ISO 9001:2015 accreditation, people often ask these questions “Why does our company need to be ISO 9001 certified?” and “What do we need to do to become certified?” These are both good questions. ISO 9001 is a Quality Management Systems standard which is internationally recognised promoting quality management, consistency, best practice and customer focus. A robust Quality management System offers numerous benefits for any organisation of any size including performance optimisation, sustainability and controlled growth. So what are the benefits of ISO 9001? Compliance with this standard will also assist you in providing your company with opportunities from local, national and international companies securing your share of the market and the ability to to deliver quality products and services. At HR Services Scotland, our Commercial Consultants will support you through the process offering as much or as little support as you need. Some Companies need ISO certification in order to satisfy their Customer’s requirements. Many organisations are promoting a quality driven supply chain and are asking all suppliers to gain certification as part of their supplier approval process. We can help you work towards compliance and gain this accreditation to not only retain current business but also broaden opportunities in your marketplace to reach out to other potential clients looking for suppliers accredited to ISO 9001:2015. Whether you need certification to retain business or gain new business, our ultimate goal is to create an effective and robust quality management system to optimise performance, enhance customer satisfaction, enrich your employees and meet Company objectives. ISO 9001:2015 accreditation demonstrates to all customers and stakeholders that your business operates a Quality Management System that not only satisfies the requirements set out by the International Standards Organisation, but also your continued commitment to improving your business. Once certification has been secured, your Company can then utilise their certificate to apply for tenders, trade internationally, secure clients who promote or demand a quality supply chain and utilise this mark of excellence when competing for business. An effective Quality Management System will not only improve the quality of your products but all areas of your business. Everyone is responsible for the success of the Quality Management System and we believe that the correct training and implementation will lead to its continued success. The result of adopting a QMS will be an improved level of quality for the entire organisation across all areas of the business. Defined roles and responsibilities along with effective Key Performance Indicators will produce factual information to build and improve on, working your organisation towards business excellence. HR Services Scotland can help you to develop a QMS that will ensure you are meeting a high level of standard each and every time. Implementing a Management System will ensure quality products and services are delivered to meet and exceed customer expectations. You will meet not only their stated requirements but more of their implied requirements too. 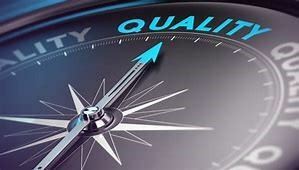 Quality also means that you may experience far fewer complaints and you may find that you are retaining more business from customers who perhaps don’t complain and source an alternative supplier without raising the issue. The non-conformance, customer feedback and improvement parts of the standard ensures stringent controls prior to delivery to the customer promoting a more proactive and risk measured approach. This leads to greater customer satisfaction and positive feedback. The ISO 9001:2015 standard requires that you identify each process and demonstrate how they flow through the organisation. Each process is then measured for effectiveness and then improvements planned and implemented. The effectiveness of the Quality Management System is communicated to all staff along with business objectives to ensure that all staff are aware of what the Company want to achieve as a whole and can all work towards it. Implementing an ISO 9001:2015 Quality Management System can empower employees. Your QMS will provide them with clear expectations in regards to quality objectives and job descriptions, the tools to do their job such as procedures and work instructions, and it will also prompt actionable feedback on their performance. The result of this will provide an improved company culture. Many companies want consistency and one way to think of it is “decreased variation”. By reducing the variation in your company’s processes is the definition of consistency. A simple question that you can ask, “Is your customer getting the best service from you supplying them with a consistent product by it being the same dimensions, same weight, same tolerances, same output every time or by your products being unpredictable and and all over the place not having any consistency at all”? Of course most companies won’t accept variation, to decrease variation your company will need to increase the control of your processes. Control comes from having a clear target or objective, by collecting data on the process metrics, you will be able to understand how to adjust the process, procedures and work instructions. If your ISO 9001:2015 QMS is working, this should then increase operational performance, product performance and consistency. Having quality objectives, metrics, and procedures within your organisation will enable management and employees to focus on what’s important. A Quality Management System is a perfect way to ensure that your company stays focused and this will continue through Internal audits, certification audits and surveillance audits. ISO 9001:2015 certification requires that the company periodically audits its quality processes. Regular process audits will provide the objective feedback that is needed to correct any deviations from the quality management system and it will keep the company focused on its goals. Your Quality Management System is the perfect starting point for your journey towards Quality Excellence. Key performance indicators will provide your organisation with valuable information to make improvements throughout the business. Improvements can increase customer satisfaction leading to new business and retaining current clients, reduction of waste and reduced costs due to consistently high quality products and the confidence that measurements in place will ensure continuous improvement. ISO 9001 is a worldwide standard administered by the International Organization for Standardization (ISO), which is based in Switzerland. Currently over 1 million companies worldwide have ISO 9001:2015 certification. Achieving ISO 9001:2015 certification will place your organisation in a very select group and HR Services Scotland can assist in helping your company become a part of that select group. Once you have secured ISO 9001:2015, you would communicate to all stakeholders and interested parties your achievement. The business can submit tenders, enter new markets and trade internationally. Clients engage with HR Services Scotland to support them in planning their growth and making sure that they have the resources in place to meet the demands of existing clients as well the capacity to accommodate new clients. We create a quality management system to enable you to monitor, analyse and plan growth by delivering an operational model sustainable for managing new opportunities without compromising existing business. You will not be able to use or modify ISO’s logo. It is ISO’s brand and intellectual property. You will be unable to say ISO 9001 or ISO certified. You must spell it out. We are ISO 9001:2015 certified we are not certified by ISO or by ISO 9001. ISO 9001:2015 cannot be listed on your products or used in literature to imply product certification as it is not a product certification, it is a company certification. You must be careful with your scope description so it properly depicts your certified activities and geographic locations. If we can help you with this please contact our Commercial Consultants on 0800 652 2610 and they will be happy to discuss the process and help make your business ISO 9001 compliant. If you have any other HR or Health and Safety issues, please do not hesitate to contact a member of our HR or Health and Safety Team at HR Services Scotland Ltd on 0800 652 2610. This entry was posted in HR Services on February 1, 2018 by admin.